It's officially Fall! Ok, so not really, but as soon as September 1 rolls around, I officially give myself permission to start shopping, and after Labor Day I allow myself to start decorating!! Fall is my favorite season for so many reasons that I honestly can't even put into words. Something about the combination of the crispness of the air, the smells, the colors, how it ushers in the holiday season, the excitement of football season,seriously every element of Autumn ignites the serotonin in my brain and I'm on a seasonal high from September - December 25th! I hope you love Fall as well, because for the next two months, every post I make will relate to Fall in some way I'm sure! This week's SUNDAY SEVEN is some of my Fall favorites for this week!! I hope you like them! It is officially the time of year when every retailer starts rolling out their "pumpkin spice" everything! I don't drink coffee, so my equivalent of the pumpkin spice latte craze is definitely a seasonal cupcake! Sprinkles has brought back their Pumpkin cupcake for the Fall season! I can't wait to get by their store or ATM this week to grab one!! Pumpkin cake with cream cheese icing?! DONE! I'm excited to trade in my bright summer colors for the more muted neutrals of Autumn. I tend to call myself color averse as I prefer neutrals to color any day! When it comes to my nails, as an art teacher, polish on my hands is completely pointless as I'm constantly washing my hands to get whatever medium I'm working in off of them! So in the cooler weather I'm basically painting my toenails for myself, but its worth it to me! I'm new to the Smith and Cult obsession, but now that I'm aware, I'm just as addicted as everyone else! Their shades for Fall are giving me all sorts of happy feels, especially Bitter Buddhist, Fauntleroy, Stockholm Syndrome, Subnormal, and Honey Hush. Honestly I wanted to list them all, but felt that was excessive! That's how awesome their colors are!!! You MUST check them out!!! Yesterday I went by my favorite local antique store to look for a few new silver pieces to go above our bed. While I was there I came across the most adorable velvet pumpkins! They were selling them for $15 each, and I bought one because they were so cute, but also to serve as an example so I could make my own much larger ones! My current pumpkin collection is mostly mercury glass, so I know I need something Stella appropriate or else she'll want to play/break all of my glass ones! I was going to just play around and make my own DIY post, but I happened to stumble upon this DIY from She Holds Dearly instead!! Her tutorial calls for beans or rice as the filling, but the one I bought from the antique store is just standard pillow fluff which in my opinion is the better way to go if you have toddlers in your house!! I'll post my photos when I make my bigger versions soon!! So technically this has been one of my weekly faves for about three months now!! Now that I have a "real" camera, I'm in need of a new camera bag! I've been swooning over this Lo & Sons bag for a few months now, but can't seem to justify the price to myself! I'm going to ask for it for my birthday next month though! It is so much cuter than a standard camera bag, yet just as functional! I'm obsessed with this grey one!! Matt are you reading this?! I spent this weekend deep cleaning my house and cleaning out my flower beds in preparation for Fall decorating! I like to have a clean slate before bringing in anything new! 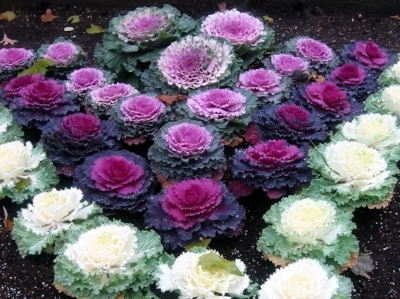 When it comes to Fall, my go to flower bed items are always mums, ornamental cabbage, and pansies! This trio has yet to disappoint! There are so many color combinations, so they're perfect for everyone's style! I love the ornamental cabbage and pansies because here in Texas where the winters are mild, these plants will last through the winter and all the way to March when I begin the process of changing out my spring beds! 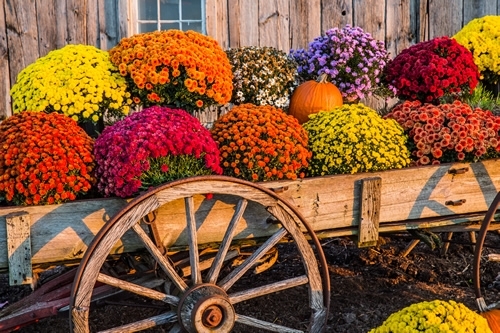 As for the mums, is it truly Fall if you don't have a mum or two somewhere? I think not! I'll still wait a couple of weeks before I plant this trio as the weather needs to cool down a bit, but I'm already prepping and planning for their planting now!! I love a good Labor Day sale, and I'm loving that Shutterfly is offering 50% off everything through Tuesday! I love changing out the photos in our home a couple of times of year to reflect Stella's growth, so I'm taking advantage of this sale to order some of the larger prints I need! This would also be a good time to make an end of summer photo book or design your Christmas cards early if you already have the perfect photo!! At school, sometimes the aroma from a classroom of 34 preteens is less than pleasant! While we aren't allowed to burn candles or use plug ins for fire safety purposes, we can use a cool air diffuser! Now that Fall is on the horizon, I want to change the essential oil blend to a more festive scent! I found a Pumpkin Spice blend recipe that I'm dying to try! While many people buy and sell essential oils for body uses, I strictly use them for smell, so the brand doesn't particularly matter to me! I tend to buy the NOW brand because I can find them easily at Central Market when I grocery shop! I use this diffuser I bought on Amazon! It allows me to set a 6hr timer which is perfect for the school day! It has an automatic shut off, so I don't have to worry if I forget about it at the end of the day!! I hope you love this week's SUNDAY SEVEN! !